Why do you play poker? When asked that question, a casual player may respond, “for fun.” Players who are a bit more competitive may say they take a seat at the felt to boost their ego and earn a little spending money. People who are even more serious about the game may say they aspire to become a semi-pro, part-time player. If you take poker seriously enough, you may dream of becoming a full-time, pro poker player. You have your work cut out for you if you want to be a professional at Texas Hold ’Em. Only a very small percentage of players in any given room will profit from their play over the long term — so you’ll need to work hard to make your dream a reality. If you play seriously or pursue a career as a professional poker player, keep the following adage in mind — “Texas Hold ’Em takes a moment to learn, but a lifetime to master.” Remembering that phrase will help you weather the storm when you encounter rough seas at the table. What Is Texas Hold ‘Em? It is a poker variation in which players receive two cards, dealt face down, that they combine with five community cards to get the best five-card hand. You must learn the rules of Texas Hold ’Em before going pro. If you already know how to play the game, you can skip to the next section because the following few paragraphs are intended for beginner poker players. Texas Hold ’Em differs from a lot of other poker variants because every player at the table uses community cards to make their hands. It’s also one of the easier forms of poker to play, in theory, at least. Fixed limit: You can only raise up to a certain amount when it’s your turn to bet. No limit: You can make big bets with your entire chip stack whenever you desire. Texas Hold ’Em is played in two formats, tournaments and ring or cash games. The strategy for each can differ greatly from one to the other. You can’t re-buy, or purchase an option to re-enter after you lose all your money, in most tournaments, which means the goal is to outlast the other players with the chips you start out with. In a ring game, you can re-buy as often as you’d like, which means it doesn’t matter how quickly you blow through your chip stack as long as you can comfortably afford to re-up your stack. The goal of every round in Texas Hold ’Em is to make the best five-card hand according to traditional poker hand rankings, with a straight flush being the best possible hand. While the five community cards may form an excellent hand, you have good odds of beating it using a combination of one or two of your hole cards and some of the community cards. To start a round of play, every player receives two cards face down. These are known as your hole cards, and only you can use them to build a hand. Once everyone has their hole cards, every player has the opportunity to check, bet or fold. After that round of betting, the three community cards are dealt face up in the middle of the felt. Together, those three cards are referred to as “the flop.” Once the flop is on the table, another round of betting ensues. When the betting stops, the turn, or the fourth shared card, will be dealt next to the flop. As you probably guessed, another round of betting follows. After that, the final community card, the river, is dealt. Following that reveal, the final round of betting takes place. A showdown, in which players reveal their cards to see who’s holding the better hand. Everyone but one player folds, making the player who remains in the hand the winner of the pot. Even before a single card is dealt in a round of play, there will be money at stake. Two players post blinds before play begins, the big blind and the small blind. The big blind is usually twice as big as the small blind. The blinds will rotate one seat over after each round of play, which means everyone at a given table becomes the big and small blinds at some point, assuming they don’t go broke too early. Blinds force action and ensure there’s a pot for players to compete for. Antes serve a similar purpose — they build the pot. Antes aren’t limited to two players per round, however. If a table has an ante, everyone at the table contributes the ante amount to the pot before a hand begins. Blinds and antes typically increase during tournament play at set intervals. Manage your bankroll carefully to avoid being blinded or anteed out of the tourney. Just like the blinds rotate around the table one player at a time, so does the dealer button. The dealer button represents where the dealer would be sitting if the person were playing in the game. The dealer gets to act last in a hand. As a general rule, the later a person acts in a round of Texas Hold ’Em, the more advantageous it is for seasoned and professional players who know how to play the position effectively. The small and big blinds are located to the left of the dealer button, in that order. The person in the third seat to the left of the dealer is “under the gun” because that individual will be the first to act every time cards or a card is dealt. When you’re under the gun, you have the option to call the big blind, raise or fold your hole cards. In most Texas Hold ’Em variants, the minimum raise you can make is to bet twice the amount of the big blind. The maximum raise you can make is the equivalent of all your chips in No Limit Texas Hold ’Em, while the max increase is the amount that’s in the pot in Pot Limit Texas Hold ’Em. Once the player in first position has acted, play continues around the table in a clockwise manner. Every player has the chance to fold, check, call or raise when it’s their turn. Once the final bet is called, the action in that round closes. While it may seem counterintuitive, knowing when to fold is a key element of Texas Hold ’Em. New and amateur players often make the costly mistake of playing too many hands pre- and post-flop. This can do more than cause you embarrassment. It can mark you as a fish and make you a target for players who have more experience than you do. Unless the stars align in your favor and you get nothing but the nuts, or the best possible hand, you should fold most of the hands you’re dealt as you play Texas Hold ’Em. A good rule of thumb under most circumstances is to fold all but 19 to 24 percent of your hands. If the “poker gods” are working against you during a given playing session, you’ll need to develop the discretion to fold even more often and play fewer hands. Over time, you will figure out which Texas Hold ‘Em hands to play and which to fold. Just like Texas Hold ’Em takes a lifetime to master, perfecting the art of bluffing takes time. If you haven’t become adept at reading other players and knowing how to capitalize on tells, it may be too early in your career for you to attempt bluffing. As you get better, limit your bluffs until you feel supremely confident. Whereas a poker beginner may bluff just to stay in a hand, experienced players bluff for different reasons. In one scenario, a player may bluff to convince others in the round to fold their hands when the bluffer’s cards are actually duds. In other cases, players may just call or make the minimum bet to disguise the strength of their hand and lure others to remain in the round. In the first case, the person wants to take the pot. The person bluffing in the second example prefers to increase the amount of money in the pot without raising because they know they have the nuts and their hand is unbeatable. Don’t let your emotions get the best of you when you’re at the felt. In any variant of poker, you’ll enjoy some highs and experience some pretty deep lows if you play long enough. When you’re on a hot streak, be a gracious, humble winner. When you’re on a downswing, don’t let yourself go on tilt and act out at the table. Keep calm, accept your bad beats and continue to play like the professional you’re aiming to be. Don’t have a short-term view. The road to becoming a professional player is often a long one. Days-long playing sessions, late nights that never end and grinding it out at the table are all part of the trek to becoming a pro, to be sure, but they shouldn’t be a regular way of life. To ensure you have the stamina to play over the long haul, you need to adopt a healthy lifestyle, rest regularly and maintain a work/life balance that enables you to spend an ample amount of time away from the game. You may not find this on a how to play Texas Hold ’Em for dummies cheat sheet, but the best tip you’ll ever get for playing poker or any other casino game is to play within your means. If you overextend yourself, it can have dire consequences on your poker playing career as well as your personal life. Poker is a game. The point of a game is to have fun as you try to win. If you lose sight of the fun involved with Texas Hold ’Em because you’re strapped for cash, it will have a negative influence on your play and your approach to the game. You can avoid that simply by managing your bankroll responsibly and not going into debt for a seat at the table. Another valuable tip is to only play in environments where you feel comfortable. Modern casinos maintain secure, welcoming gaming environments, but games you can play at home online may not be so reassuring. If you’re having second thoughts about laying cash on this particular virtual table or you’re unsure you can leave with your potential winnings safely, find a different home game to play. Like with other pursuits, practice is the key to success for any aspiring poker player. 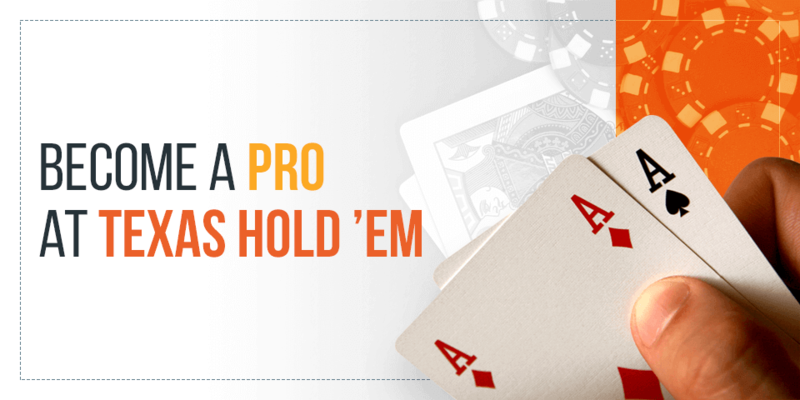 Luckily, you have plenty of options when it comes to practicing Texas Hold ’Em. One option is to play online. Depending on where you’re physically located, you might be able to play online for money legally on websites maintained by brick-and-mortar casinos that have been fully vetted by their respective home states. You might be able to play for money on other websites as well. When your cash is on the line, it’s vital for you to choose the sites you play on carefully to ensure your funds remain secure and you receive any winnings owed to you. Playing online is very different than playing live, so it’s wise to play face-to-face whenever you can. Check your area for home games and take your seat at the table in environments that are safe. You may find you prefer the familiarity of a particular casino, where you can become a regular and also enjoy the social aspects of the game. Playing in person you also get a much better chance to gauge when your opponents may be bluffing. 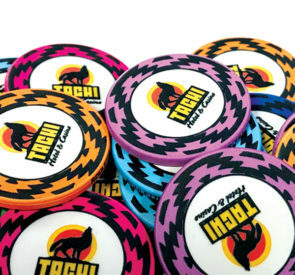 You don’t have to settle for practicing Texas Hold ’Em online or in home games when you can play in live cash games and tournaments at Tachi Palace Hotel & Casino. You’ll find our dedicated, non-smoking poker room on the third floor of our inviting casino. Our poker room hosts limit and no limit games 24 hours per day, seven days per week. We offer daily deals that can make the time you spend in our casino playing Texas Hold ’Em even more enjoyable. 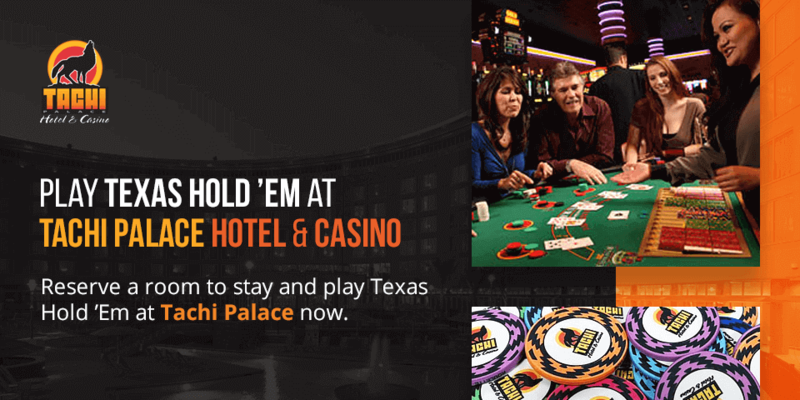 Reserve a room to stay and play Texas Hold ’Em at Tachi Palace now.